Paros! Vacation guide to Paros, Greece for 2019. Sandy beaches with exotic water, windmills combined on the traditional Cycladic style. In Paros, there is the commercial and passenger port of the island, the administrative and economic center, a modern state with a strong past and a promising future. Parikia, the capital of the island, is built amphitheatrically around the harbor and features a characteristic Cycladic architecture with white houses and intense blue painted windows and doors. A large windmill welcomes you at the entrance of your harbor, which is the trademark of Paros. Back from Parikia's port, there is the town's principal church, the Panagia Ekatontapiliani, literally meaning "church of the hundred doors". The picturesque alleys and the Venetian castle on the beach give a magnificent note to the whole scene. Naoussa is built on the second great bay of Paros and has played an important role since the era of Komninos. At the harbor there is a small castle called Kastelli, a work of the Venetians, a large part of which is preserved until today, while a bit further is the church of Agios Nikolaos, patron of sailors and fishermen, since Naoussa still has a significant number of fishing vessels today. On the harbor you will find plenty of taverns, bars, cafes and restaurants which are able to satisfy every taste. There are ferries departing daily from Piraeus to Paros, starting as early at 7:25 every morning. The ferry trip lasts is approximately 4-5 hours, docking at one port, Syros. There are ferries and speedboats departing from the port of Rafina on a daily basis, starting at 7:15. There are also smaller passenger speedboats available and depart from Rafina at 7:40 - and take only 3 hours to reach the port of Paros. The airport of Paros is located on the southern side of the island, on the way from Parikia to Alyki. It serves daily domestic flights from/to Athens and occasionally from/to Thessaloniki. The flight time from Athens to Paros is 40 minutes and from Thessaloniki 1 hour. In the summer time, the airport of Paros also serves charter and low-cost flights from various European airports. Whichever way you choose to get to Paros, you'll sure have a great time! UP Living has selected the best hotel of Paros to upgrade. 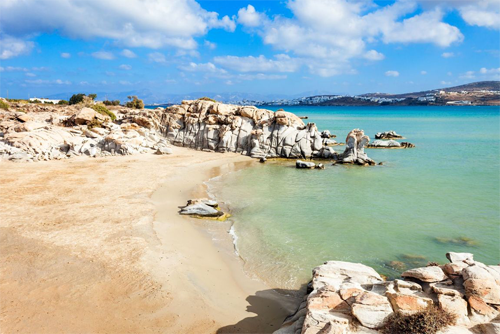 In Paros there are beaches suitable for every type of visitors: for families, for parties or sea sports lovers and for couples in their honeymoon. Here you can find golden sandy beaches for all tastes. The cool breeze waves the foliage of orange and pomegranates and offers wonderful moments to the island's visitors.